Alice Playten (née Plotkin; August 28, 1947 – June 25, 2011) was an American actress. 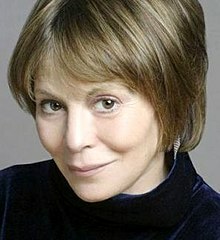 Born in New York City, Playten began her career in the Broadway musical Gypsy (1959). Her other Broadway credits included Oliver!, Henry, Sweet Henry, Hello, Dolly!, Rumors, Seussical, and Caroline, or Change. Her many off-Broadway credits include Promenade, The Last Sweet Days of Isaac, Up from Paradise, Sister Mary Ignatius Explains It All for You, Spoils of War, Four Short Operas, First Lady Suite, A Flea in Her Ear, National Lampoon's Lemmings and Shlemiel the First. Playten's screen credits include Ladybug Ladybug (1963), Who Killed Mary What's 'Er Name? (1971), California Dreaming (1979), Legend (1985), and I.Q. (1994). She wore heavy makeup and prosthetics in Legend to portray the character of 'Blix', a major minion of the Lord of Darkness; she also dubbed the voice of Gump. She did voice work in several animated features, including Felix the Cat, Really Rosie, Heavy Metal, Doug, Doug's 1st Movie and My Little Pony: The Movie. She was a regular on the children's television series The Lost Saucer and That's Cat, appeared in National Lampoon's Disco Beaver from Outer Space during the early days of HBO, and had guest shots on Frasier, Law & Order, Third Watch, and As the World Turns, among others. She performed a romantic dialog with Rupert Holmes in his song "Our National Pastime" on his 1974 debut album Widescreen. Playten may have been best known for her role of the newlywed who makes a gigantic dumpling as the first meal she cooks for her husband (Terry Kiser) in two classic 1969-1970 Alka-Seltzer commercials. Playten died on June 25, 2011 at Sloan-Kettering Hospital in Manhattan from heart failure after a lifetime of juvenile diabetes, complicated by pancreatic cancer. On November 14, 2011 a retrospective of her work was held at the Second Stage Theater, New York. 1981 Heavy Metal Gloria (voice) Segment: "So Beautiful and So Dangerous"
1991 Monsters Violet Mitla "The Moving Finger"
1992 Ghostwriter Parrot (voice) "Ghost Story: Parts 3 & 5"
1997 Remember WENN Jane Smith (voice) "Caller I.D." 1998 New York Undercover Homeless Woman "Spare Parts"
1999 Frasier Bonnie "Our Parents, Ourselves", "Shutout in Seattle: Parts 1 & 2"
2001 Third Watch Sandy "The Self-Importance of Being Carlos"
2001 Law & Order Dog Walker "Who Let the Dogs Out?" 2001 The Education of Max Bickford Mrs. Lynch "A Very Great Man"
2006 The Book of Daniel Francesca "Acceptance", "Assignation"